Ramblings from a Raucous Mind: Richmond Eats! About two weeks ago, I hit up the city of Richmond, BC. I hadn't taken much time to explore Richmond before, typically just heading straight into Vancouver instead. Well not this time, and man, was my inner chowhound happy about that! 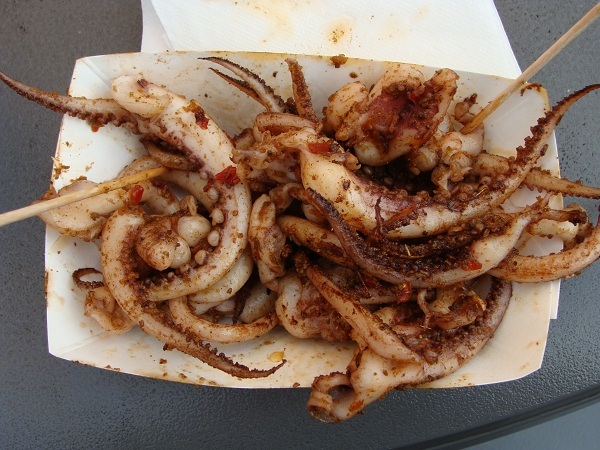 Spicy BBQ squid from the Summer Night Market. YUM. I did a lot of eating on this trip, and it was all good. In particular, I ventured into the two night markets for the Asian street grub. Amid all the Hello Kitty gear and cell phone accessories, you'll find an Asian street food court with delights you need to try! Check it out in my piece for BC Living.